It all began with a bus shelter ad. Joe and I had just started dating, and were instantly bonded by the creepy, ominous presence of one man: El Cucuy. His huge face was everywhere: plastered around bus benches, bus shelters, and buses throughout the city (hmmm... what demographic do you think they were targeting?). His eyes were stark and vacant, his shirt bright yellow, and his smile psychotic. We couldn't help but stop and imitate every single one that crossed our paths, cracking up. Eventually El Cucuy grew into so much more than a Mexican morning DJ. With the help of our overactive imaginations, he became a mythical beast - Cucuy, the prehistoric birdlike creature with blood on his beak. The story grew more and more elaborate - his origins, his nemeses, his temperament - and was often accompanied by bird cries and songs. Cucuy was shorted to Cuy in the habit of nicknames, and adopted as a term of endearment. How an imaginary bloody-beaked creature became our sweetheart nickname is beyond me. But it did. Cuys stood for something that we could only be with one another. It was a state of being. It stood for lovers, best friends, and partners in weirdness. Even in the roughest times (aka living in a van together), we had one rule: Cuys Never Die. To this, Karen (Joe's mom) has said "until they die and go to heaven." But I disagree. 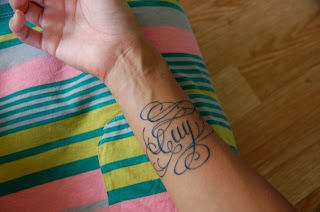 Cuys - in essence, in memory, in life experience, in depth, in love - Never Die. *originally written by Rachel at FACEBOOK. If you have already commented there and would like to repeat the comment here, please feel free to do so. Rachel, it was nice to see you at Joe and Karen's yesterday, and be able to chat with you, Joe and Karen for a bit. I love this Cuy tale... a special tale of a precious endearing call. Sweet Rachel...Now abide these three--- faith, hope, and love...but the greatest of these is love. Love never fails. My son was so blessed to be loved by you, beautiful girl. We love you with all our hearts. Thanks so much for sharing this with us! It is special! I can just picture that whole scene! The best nick names come from the fun we have with the one we love. I continue to keep you in prayer Rachel.